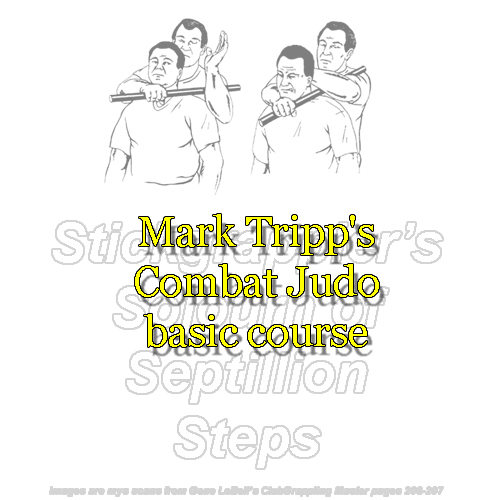 This is a copy of Mark Tripp's Combat Judo basic course. 1. Don’t drink to excess, avoid those who do. 2. Do not use illegal drugs, avoid those who do. 3. Do not pursue illicit sexual encounters. a. Brevity and Simplicity above all else! b. There are NO rules! Go for the family jewels! c. There is NO defense; ATTACK! c. Stay on your feet, NO ground fighting! c. A and B above against more than one opponent. 1. Remember the goal is to end the fight not win a match. 2. Get to your feet ASAP! 3. NEVER go to the ground unless forced to. by attacking the eye, the groin, biting or stomping the instep. 3. Grab ANYTHING and smash him!